I can’t believe that I haven’t reviewed this book before. I remember first getting this comic, and being amazed at the way the acetate cover was used to give a gorgeous, full-bleed cover free of the cover elements. This wasn’t my first painted comic, Books of Magic probably came first for me, but this was the one that changed something for me. This one had the feel of a traditional comic book, and felt like a big deal. Books of Magic felt like a story, and introduction at the most. It was also split between four artists, and this was one artist who seemed to make the characters in the comics feel real. Some newspaper reporters and photographers are sitting around and discussing the war in Europe. One of them, a photographer named Phil Shelton wants to go to Europe and make his career as a war photographer. Another J. Jonah Jameson wants to stay in New York, where he hopes to one day run the Daily Bugle. Jameson goes off to cover a labor dispute and Phil goes on to cover a press conference by a scientist, Phineas T. Horton. He’s unimpressed by the talk of a synthetic man he had created. However, when he adds oxygen to the synthetic man’s chamber, it bursts into flame. The few reporters there are dubious, until the android moves. The reporters are horrified and demand that Horton destroy it. Later, while the press puts pressure on him, Horton buries it. Weeks pass and Phil is beginning to talk with his girlfriend Doris about their future together. Suddenly there’s commotion and Phil grabs his camera. He runs towards the screaming to find Horton’s Human Torch running through the street. The Torch leaps into the air, and the general populace quickly put the entire incident out of their minds. A few days later, Doris tells Phil about a naked man on the docks that had taken a girl from the hospital. The policemen’s bullets didn’t hurt him. He threw a police car and jumped in the water to swim away, never coming up for air. The cook at the diner tells of hearing this “Sub-Mariner” wrecking a power plant and flying over Central Park. The others in the diner think that the stories are bogus. However, in the days to come, the Human Torch and Sub-Mariner perform multiple acts of heroism. One night even finds Shelton sitting next to the Human Torch while J. Jonah Jameson rails against the heroes Shelton calls “the Marvels.” Shelton’s fascination with them has him turn down the European assignment he’s been wanting. His anxiety builds to a peak when the Human Torch tries to stop the Sub-Mariner from rampaging across New York. Shelton and other journalists chase the battle across the city, witnessing the aftermath and damage of their battle. As Shelton, his fiancée Doris and many others are in a makeshift shelter, Shelton rants against the Marvels. 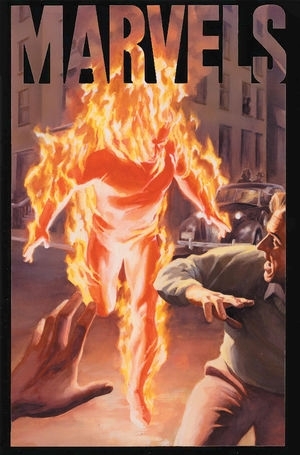 As the Torch and Sub-Mariner return to New York, Shelton and some reporters chase them down to find the pair coming to a truce at the urging of policewoman Betty Dean. There were no repercussions on the Marvels and it has left Shelton very anxious. Shelton finds Doris and suggests delaying their wedding. She calls it off entirely and returns the engagement ring. As the months carry over into 1941, a new Marvel debuts. 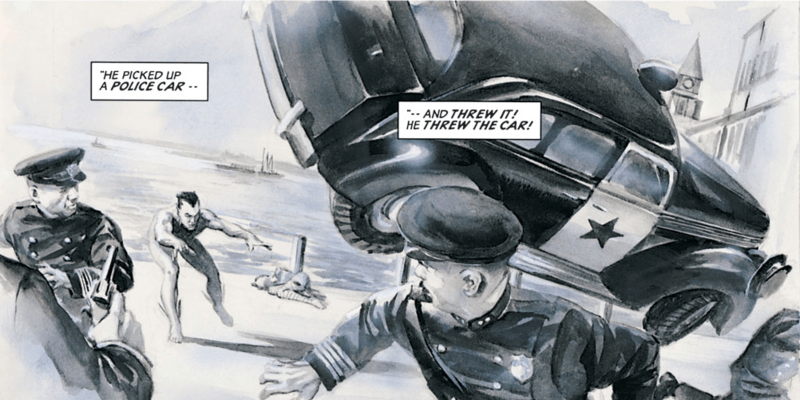 Captain America fights Nazi spies and saboteurs, capturing the attention and admiration of Americans. It isn’t until he sees a newsreel at a theater that Shelton gets the appeal of the Marvels, as the crowd cheers the efforts of the Torch and Sub-Mariner defeating Nazis. At that same theater he sees Doris again. He asks her to get back together and she agrees. That fall, the Sub-Mariner launches an attack on civilization, culminating with a tidal wave launched at southern Manhattan. J. Jonah Jameson watches from the safety of a steel grate-covered window high in a stairwell. Shelton runs to the roof to get the best shot he can. The Torch and Namor battle, and a stray piece of broken masonry strikes Phil Shelton in the face, costing him an eye. Doris runs to his hospital bed, worried that his anxiety over the Marvels has returned or developed into hatred. It hasn’t, and Shelton wants to get married before he follows the war to Europe. In Europe, Phil covers the war, specifically following the Marvels as they aid in the war effort. Before I talk about the artwork, I want to address the story. As I recall, Kurt Busiek worked closely with Alex Ross on the premise, which is the history of the Marvel Universe from the average man’s point of view. It works to draw the reader in and make them part of the story. Phil Shelton operates as our proxy in the Marvel Universe. In this issue, it’s the dawn of the superhuman. Shelton mentions the mystery men that emerged at this same time,. Less time is given to them, and much more is devoted to Namor and the Human Torch. Given that the focus of Marvels is on the superhuman members of the hero community, it makes more sense than to delve too much into Captain America’s early adventures. The Human Torch’s android origin is known publicly, which I’m ashamed to say that I don’t know if that was true in his Golden Age adventures. One of these days I’ll go and seek those out. Namor is portrayed as the boogeyman. However, he sometimes gets referred to as “one of our boys.” He remains as the symbol of the threat superhumans are to ordinary people. We don’t ever see him interact with normal people, outside of Betty Dean, who makes only a passing appearance in the first Torch/Namor battle. While Captain America represents the hope normal humans have in sharing the world with superhumans, Namor represents the indifference superhumans sometime exhibit towards normal people. As an aside, it reminds me of the scene in this season’s third episode of Supergirl where, during the Daxamite invasion, Martian Manhunter and a Daxamite crash through the Lockwood home, and after defeating the Daxamite, the Martian looks at the family and tells them that they’re safe. Of course, he does this while their home erupts into flame behind him. The artwork has a watercolor vibe to it. I believe that at this point, Alex Ross was using gouache, which can give this watercolor look. In the last days before computer coloring took over the comics industry, the fashion for colorists was watercolor-style coloring. It was a thing for a brief time. Overall, it wasn’t successful when combined with line art. I think the medium works here because of the bright colors Alex Ross uses. He also doesn’t shy away from detail, but uses the impression of details where he needs to, helping to accentuate motion or in the case of Nick Fury’s cameo, foreshadowing the eye he will later lose. I mentioned the bright colors that Alex Ross uses. What I didn’t mention is that those colors are almost entirely reserved for the Marvels. Everyday scenes are very subdued, almost sepia-tone. This helps work with the tone of the story that Phil Shelton sees the Marvels apart from humanity. Alex Ross is great when he’s collaborating with another writer because he creates artwork that serves the story. Comics are a story-telling medium, and more artists need to learn that. Unfortunately, if there’s a weak part to this comic, even this series, it’s that the font used is far too generic. If you just look at the panel above, you can see that every letter is the same where it shows up instead of having variations to imitate hand lettering. Where it opens up in large for sound effects or really magnanimous speech like the introduction of the Human Torch, it stand out and draws attention away from the artwork. If the art has to serve the story, then the lettering needs to as well. Distracting from the other elements doesn’t serve the story. I blame this less on the letterer and more on 1994 being the beginning of the use of computerized lettering. Pioneers in the use of fonts like Richard Starkings had yet to really take the role of the letterer into the realm of a recognized member art team. Marvels is one of those series that stays in print in one form or another. Currently, it’s available in Trade Paperback (ISBN: 978-0785142867), and Hardcover (ISBN: 978-8491673408). Of course, it’s also available in digital formats, including, but not limited to, Comixology, and it’s even available to read as part of Marvel Unlimited. If you’re looking for a hard copy of the single issues, don’t pay into the double digits for a copy. You may find them really affordable at a convention.